The “Live In The City Of Light” album was the third one in a row to reach #1 on the UK album charts. Obviously, someone, liked it. The band decamped to Loch Earn, Scotland to build their studios there as 1987 rolled along. Once their studios were complete, demo sessions began for their next album. One song filtered out since it was written specifically for the event it was premiered at. Simple Minds had given the proceeds from the fourth single from “Once Upon A Time” to Amnesty International, so it was not out of order when the Nelson Mandela 70th Birthday Tribute concert was announced, that Simple Minds were on the bill for the Wembley Arena show. They had been under the misconception that all bands were to have written a song specifically for it, so in June of 1988, they debuted “Mandela Day” to the worldwide audience watching. The song was slight. It sounded like a Dire Straits B-side, should such things exist. Even Jim Kerr admitted that it was written in five minutes, but the sentiments were certainly appropriate for the event itself. 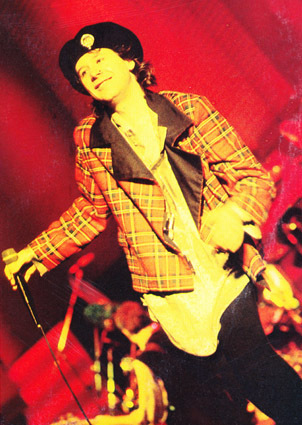 As it turned out, Simple Minds were the only band to have featured a song written specifically for the show due to their misreading of the situation. Simultaneous with the show was the news that none other than Mr. Trevor C. Horn himself, of ZTT fame, was tapped to co-produce the album with his lieutenant Steven Lipson. At the time I was hopeful, that the infamous ZTT dynamics would be the right thing to lift Simple Minds out of the doldrums that I found them in. The last half of 1988 was a period where nothing was heard from the band. I was aware that one does not have an album recorded quickly by Horn. I could not even remember a full album under his watch since “Slave To The Rhythm.” Only one off tracks had filtered out with Horn at the helm, but to his credit, “If Left To My Own Devices” with Pet Shop Boys, had enough inventiveness for many artists whole albums. I’d be lying if I said that I was not looking forward to the results. The wait ended in early 1989 when a three song EP, “Ballad of The Streets” appeared, but in spite of my best efforts, I never managed to find a copy for sale on CD format. By 1989, I was buying 90% of my singles on CD format, and I certainly preferred it that way! No more recording 12″ singles to tape! I knew the CD was out there and I was holding out for the shiny silver disc of these tracks, but that day never came. To this day, I have not seen a copy of the “Ballad Of The Streets” EP on CD for sale …ever. What I didn’t know at the time was that the fates were conspiring to protect my ears. As Spring of 1989 transitioned into Summer, the new Simple Minds album, “Street Fighting Years” was released. I bought a copy at Murmur Records, since I was then working at an agency two blocks away at the time and walking to the best record store in Orlando each day on my lunch hour was one of the few perks of that particular job. To say it wasn’t pretty is an understatement. Next: …Horn of Plenty Nothing! This entry was posted in Core Collection, Mid-80s Malaise and tagged 1988, NElson Mandela, Rock GPA, Simple Minds, Trevor Horn. Bookmark the permalink. nick – You would have to pay me to have that thing in my house! Not even the sick collector in me would want many years of Simple Minds output! “Mandela Day” is somewhat unique for Burchill’s slide playing, which off the top of head, I don’t think he used on any other SM song (at least not up to that point). It’s not bad a tune, but again, when did SM’s music become so “important” to the fate of the world? I can remember looking at the LP cover for SFY in Spec’s and thinking to myself, “Who do these guys think they are?” followed by, “Oh, there’s only three of them left now.” This was before any real fandom of the band on my part, which admittedly only began about 10 years ago. I did know enough about them from NGD through LITCOL, however, to know that they had become too big for their breeches. zoo – The slide playing definitely evoked Dire Straits for me, and not in a good way. I don’t completely hate Dire Straits though. “Making Movies” is pretty good! Jimmy Iovine [!] produced and I encouraged my wife to buy a copy when she was in a Dire Straits mood and we saw it used. I can still miss most of their career, though. If I were Trevor C. Horn, Street Fighting Years would be one of the projects I would loose from my CV to keep it to one page. Echorich – Succinctly put… but it was still #1. Sigh. Yeah, I don’t hate Dire Straits either. Making Movies is a pretty good album, and I still like their first big hit, “Sultans of Swing” (very good guitar solo!). Man that Jimmy Iovine gets around, I’d read his bio (like he’s got time to write one) even if he is mostly known these days for his association with Dr. Dre and those awful headphones. He’s what they call “canny,” and his memorable turn as a prison inmate on “Family Guy” in an episode where the whole family becomes a Partridge/Brady type family band is a particularly memorable one. chasinvictoria – I can’t believe you missed an opportunity to talk about Iovine’s seat on the Apple BOD! What next? Missing Dr.Who references? !